You think that we have leadership problems in our country, and then you look around the globe and realize that we are pretty well off, irrespective of who wins any of the elections next month. We talk about problems in our economy and we debate about the implications of economic indicators moving by fractions of a percentage point. But you consider the double digit inflation or deflation that lesser (that’s right, I said lesser) countries are experiencing and you have to hand it to our Federal Reserve for maintaining the status quo. Don’t get me wrong, I still critique (mostly for humor’s sake) and maintain the right to continue to do so, provided that the would-be shark riders back east don’t rescind the 1st amendment anytime soon. At the close of business today, 3/4 of the year 2016 will be behind us. While most measures of growth still aren’t in the still-targeted 2-2.5%, we are fairly close. A measure of household spending, Personal Consumption Expenditures was released today. The study shows that the costs of running a family increased 0.2% last month and 1.7% since this time last year. Where such spending accounts for 2/3 of our country’s GDP, it’s a big deal. The good news for all of us is that Personal Income increased in lockstep with our consumption, but once again also shows that it’s pretty easy to spend everything you earn. Does anybody know where I can buy a shark? The final reading of the second quarter Gross Domestic Product for the U.S. comes in at a 1.4% growth rate. That’s higher than initial measurements and also higher than expectations. The Fed still wants to see that number in the 2.0-2.5% range. Improvement is improvement, even if the going seems slow. The Case Shiller Home Price Index shows a 5.0% appreciation rate over the last 12 months, just below the 5.1% anticipated. The report that blew the doors off the walls this morning was Consumer Confidence, registering a 104.1 when a 98.0 was expected. I can’t remember a time when Consumer Confidence was over 100. If consumers now actually spend their money on stuff, that might cause the wheels to keep turning, which will eventually give the Fed the growth numbers they need to see to raise interest rates. For now, let’s celebrate the great rates we have! I am heading to Lake Powell this afternoon. I heard that it’s going to be windy and rainy all over the state for the next few days and I thought “why not make an adventure out of the inclement weather by experiencing it on a houseboat on a body of water where the waves have nowhere to go but back at you?”. But since I still have four hours to kill here at the office, let’s talk about interest rates and housing for a minute. The Bank of Japan committed to do whatever necessary to keep their 10 year bond at 0%. Our own central bankers of course meet today and there is a 12% chance that they will raise interest rates today, and a 60% chance that they will hike by December. I am of the opinion that they should raise them today for the same reason that I am going to Lake Powell in a fall storm: carpe diem. There is no such thing as perfect timing in this life; you just do the best you can with what you have. Plus remember that when they hiked last December, our mortgage rates actually decreased by 0.25% :). Here is some interesting info that you might even find useful to pass along. According to Reuters today, the supply of homes under $250,000 has fallen by 12% from this time last year. The alarming statistic is that Salt Lake leads the country in dwindling starter home inventory, where the supply has decreased by 83% over the last four years. Last December, policymakers forecast that the Fed would raise rates four times in 2016. With three more meetings to go (including today’s) and having hiked exactly zero times so far, there is no possibility at all that they are not going to hit four. Last month, the Chair and Vice-Chair hinted that the central bank could plausibly effect two rate hikes this year. Even still, only two out of the 23 Fed preferred bond traders think that a rate hike will be announced at the conclusion of tomorrow’s meeting. Futures traders are pricing in a 20% chance that the Board of Governors hike the discount rate tomorrow. I on the other hand think that tomorrow could be the day that they do kick the rate up .25% to a whopping .5%. This accomplishes two things: The first is conveying the sentiment that the economy is in fact getting better, instilling confidence in a financial system that has been in the sickbed for the better part of a decade. The other agenda accomplished by a rate hike tomorrow is giving the Fed additional ammunition to drop interest rates again in the future when there is a slowdown (see, I am not entirely optimistic). I place the probability of a rate increase tomorrow by the Fed at 50%. And if they do, I see mortgage rates dropping again. The DOW is up 100 and Mortgage Bonds are flat after a bombing in New York over the weekend and ahead of the Fed meeting starting tomorrow. here is a 12% chance that the Open Market Committee will raise rates 0.25%. Over the last 12 months, the Consumer Price Index has only raised 1.1%. Between 1977-1981 it rose an average of 10.1% per year. The going interest rates then and now reflect the growth and lack thereof. Where the Cost of Funds Rate has been so low for so long and we still haven’t seen much growth, the Fed’s weapon of choice has been rendered virtually useless. The party could be over. Not the party that everyone is saying is finished; that one is purely a spectacle at this point–and if I may say so, a disgrace to the principles of truth and virtue upon which this great country was founded. As Forrest Gump would say, “that’s all I have to say about that”. I am talking about the low interest rate party that we have been celebrating since Great Britain seceded from the Union a few months ago. If you will remember when that happened, interest rates dropped about 1/4% over the next few trading sessions, causing a mini refinance boom and handily paying for my family’s summer vacation to New York City. But now that the weather is turning colder and traders are covering up the swimming pools and getting out their cashmere turtle necks, it’s become time to sell stuff. Oil, Stocks, and Bonds are all getting the boot to free up some Wall Street cash. All that selling has pushed mortgage prices down under a level that had held its ground all summer long. My concern is that we aren’t going to break above that line anytime soon. That means higher rates ahead, irrespective of the outcome of the FOMC meeting next week. The likelihood of a hike at next week’s FOMC meeting is now just at 11%. Based on the varying messages that the various Fed Governors have conveyed at their multifarious speeches this last week, it’s clear that as a body they are unclear on the future of the economy. The lower prospect of a short-term rate hike combined with lower oil prices are weighing heavily on stocks and bonds, which are both down so far this morning. Fannie Mae Bonds are only down 3bps, while the DOW has fallen by over 200 points. This photo is supposed to connote the markets taking a breather, but I don’t think that they are as calm as the depiction suggests. There is one game every year that I don’t miss and it starts tomorrow at 5:30 pm. This one game is the reason that I pay for cable TV for the rest of the year. Consider this a public service announcement. 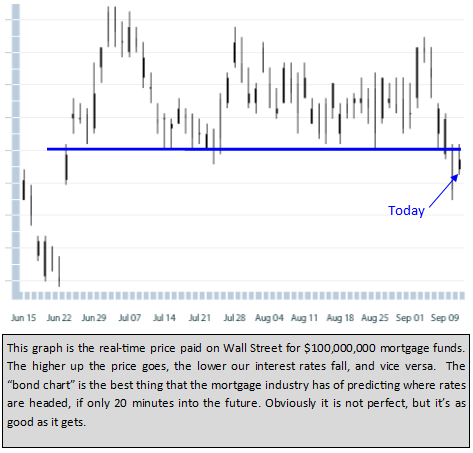 Mortgage rates look to be trending upward, following suit to rising bond yields all over the world. Mortgage interest rates of course move independently from shorter-term loans which are based on Prime, but it’s still worth noting the general trends happening in the debt markets as an indicator for what could be in store. The Fed governors have been touring the speaking circuits this week, arguing for and against a rate hike at the Open Market Committee meeting which convenes in a couple of weeks. The Fed Funds Futures shows only an 18% chance of a Fed rate hike at that meeting. According to President Obama’s Council of Economic Advisers, there are 10 million men missing from the workforce. The report shows that 83% of men aged 25-54 who are not currently employed were also not working last year either. Statistics like this make it easier to understand why the Fed keeps interest rates so low when the Unemployment Rate is only 5% and Jobless Claims have been running under 300,000 for a year and a half now (the longest run in almost 50 years). There are 576,000 Discouraged Workers in the U.S. Discouraged workers are persons not currently looking for work because they believe no jobs are available for them. There are another 1.1 million persons marginally attached to the labor force. Those are folks who want a job, are available for work, and have looked for a job sometime in the prior 12 months. That leaves about nine million dudes who are either independently wealthy and don’t need the money, or they are hobos and have fallen off the grid. Either way, the numbers are perplexing and make it increasingly difficult to predict the future of our economy and the direction of interest rates.